Terni is an ancient town of Italy, the capital of Terni province in southern Umbria, in the plain of the Nera river. It is 104km (65m) North of Rome, 36km (23m) NW of Rieti, and 29km (18m) South of Spoleto. The city lies on the rail line from Rome to Ancona and is the point of departure for the branch line to Rieti and L’Aquila. It is the seat of a university and is one of the most important industrial towns of Umbria. 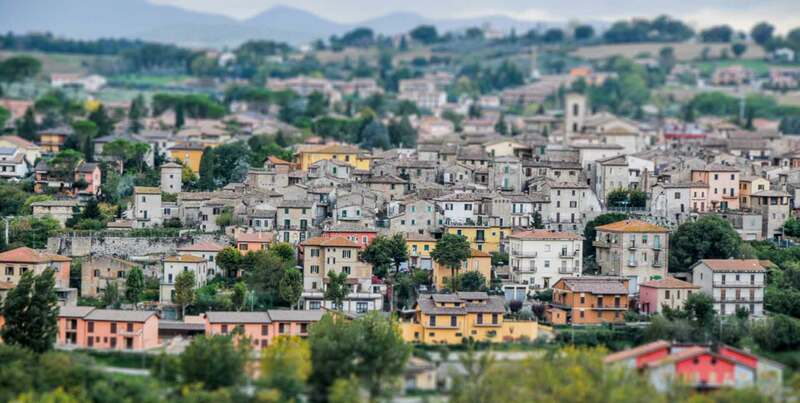 The city was probably founded in the 7th century BC by the Sabini. In the 3rd century BC, it was conquered by the Romans and soon become an important municipium lying on the Via Flaminia. The Roman name was Interamna, meaning “in between two rivers”. During the Roman Empire, the city was enriched with several buildings, including aqueducts, walls, amphitheatres, temples and bridges. In the 14th century, Terni issued a constitution of its own and from 1353 the walls were enlarged, and new channels were opened. As well as much of the Italian communes of the Late Middle Ages, it was slain by inner disputes between Guelphs and Ghibellines, and later between the two parties of Nobili and Banderari. Later it became part of the Papal States. In 1580, an ironwork, the Ferriera, was introduced to work the iron ore mined in Monteleone di Spoleto, starting the traditional industrial connotation of the city. In the 17th century, however, Terni declined further due to plagues and famines. In the 19th century. Terni took advantage of the Industrial Revolution and of the large presence of water sources in the area. New industries included a steelwork, a foundry, as well as weapons, jute and wool factories. In 1927, Terni became the capital of the province. The presence of a strong industries concentration made it a favourite target for the Allied bombardments in World War II, totalling 108 raids. Many quarters and public edifices were destroyed.